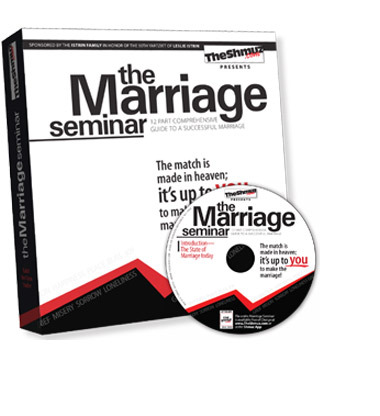 The Marriage Seminar is available as an audio series or as a book. ...But you can change the relationship, and that changes everything. In this comprehensive guide to marriage, we are given a Torah based perspective on the inner dynamics of marriage. Beginning with the assertion that HASHEM wants marriage to flourish, and that He gave us all the tools to succeed, we explore the inner workings of a relationship. Why is it that so often men and women don’t relate to each other? The Marriage Seminar – is excellent; it’s realistic, down to earth, and provides clear advice and direction. finally understand why my wife reacts the way that she does. Now I have to get her to listen to it, so she can understand me! It gave me so much of a better understanding of what marriage is, and what it’s not. "The Marriage Seminar provides the guidance and understanding needed to create a successful, harmonious, long standing marriage." By focusing on some of the most basic needs of a human, and then moving on to many of the more common pitfalls and blunders that couples make, we are given a tour of the complex weave of emotions, needs and expectations that creates a successful marriage. and then pass a driving test. a written and practical test. ALL you have to do is sign your name and pay a fee. Doesn’t a successful marriage require as much education as driving a car? Why do some marriages thrive and other’s fail? Love is the Glue that Holds It All Together—how to foster and maintain it. Now the Marriage Seminar is also avaible in book form! 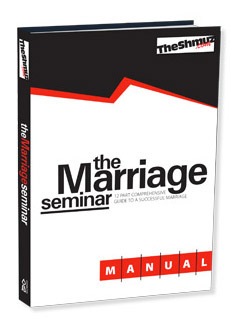 This 180 page fully sourced book is based on the information in the audio marriage seminar. It is a deailed and fully source book, and makes a great companian to the audio series, or can function as a stand alone guide to a Torah perspective on marriage.